Xeros, a cleantech company based in Rotherham, is being coy about the future versions of polymer beads that it is developing, but it is certain that applications for them will be revolutionary. In raising a further £40m in a share issue at the end of 2015, the The AIM-listed firm has boosted its R&D and engineering teams as it commercialises the technology. The patent portfolio currently comprises 40 patent filings which cover polymer bead technologies in applications from commercial and domestic laundry through to leather, metal surface treatments and information/communications technology. At the start of this year, Dr Steve Jenkins, chief science officer (pictured), stepped down as a director of Xeros to concentrate on the firm's scientific development programmes which he discussed at a recent investor's day. He told investors and potential investors about Xeros' "three bead trick," saying: "The first stage is to take stuff away from the substrate - this is of course the laundry application. Positive and negative charges on the molecule have the potential to attract the stain and it will move into the bead because nylon has this ability, when it's wet, to open up and let things diffuse into it. "Trick two is polypropylene. We use that to actually put stuff on to the substrate - the massaging effect of the beads to help things go into leathers more readily. And that's basically because they don't want to be associated with the bead - it's pretty hydrophobic and wants to move things onto the substrate. We use that to apply things like dyes and other chemicals onto things like leather. "Trick three is perhaps the most interesting one if you are a polymer scientist. It is the ability to temporarily change the surface of the bead so that it can pick stuff up, move it, and then drop it off again when you want to move it into a different part of the process. There are a lot of processes and a lot of instances where that can have a very beneficial effect." Jenkins was coy about the exact uses for the third generation beads but said that it involves taking some very expensive chemistry that couldn't previously be used in an aqueous system, and using it with beads. 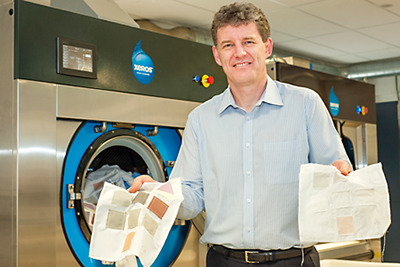 With the current focus on commercial laundry, domestic laundry and leather processing, the company has worked on identifying three new areas to target. Research continues and IP is being protected. Mark Nichols, chief executive officer at Xeros, believes that the company now has firm evidence that it is a platform technology. He added: "As Steve said, we've been coy, but the reason we are being coy with the three new substrates, is that if I announce them, it'll be out there and before we know it we have other people putting in intellectual property claims around them. Quite simply, we have to protect that right. "What I can say is, two out of those three are as large as the things we've been talking about [laundry, leather]. And what I can say is that they are adjacent - they are not a long development path away. As a consequence, I don't see that we have this very long horizon for these new additions. "What we have is a balanced portfolio of applications: here and now in laundry; soon leather; and another series coming shortly thereafter. And that provides us as a management team with great enthusiasm. We are passionate about this. We came from very different walks of life to get into this. We didn't have to do this but we really, really want to. "We do it because it has got a great commercial and financial benefits. Sure, we are doing it for extrinsic rewards, the shareholders know that we have got a good share options scheme - could be better! - but we have a great intrinsic drive here - we are doing something that is game-changing for industries. They have not seen the likes of it before."